what kind of jet is that in the pic? and the last pic of old man and the sea with two dead rats is that not an old one? wahhabi cockroach gunned down and driven over several times, most funny video of the month. Loosers are Zionists. This include Izrohell, Saudi monkey tribe and ISIS-Daeshbag filth. 1) Central Homs : SAA takes control of Qasr Al-Hīr Al-Gharbi & Al-Bīr Al-Mur south of Tayfur Airbase. This has important implications on the T4 airbase protection ring and on the offensive against Palmyra, as a flank protection. 2) Idlib : Rats are bombarding Fuah & Kafraya with dozens of mortars & rockets killing & wounding many civilians (via @HoseinMortada). Rats have announced the battle to conquer Fuah and Kafraya, may God protect the people there, if defenses fall it will be a massacre of high proportion. NDF forces trapped in electricity substation in south Hasakah are in safety Kurds surrounding ISIS. It is time someone does the right thing on this planet. DC peddling the same tired crap. battle damage to the aircraft was positively pinned on air to air missiles and 30 mm cannon fire. Besides, since it’s a US claim there is less than a 1/2 of 1% chance that it’s true. JAN-Terrorist gets today in Munich/Germany 11 years prison for fighting in Aleppo (Aleppo-Prison). Only 11 years because he made a deal with the court. 1. Adjusting a giant f in the middle of the street! 2. Accidental decapitation of their own commander and EPIC propaganda fail with the head! News article reveals that Israel assasinated syrian general Mohamad Suleiman in 2008. The general was a personal advisor of president Assad at the time. In support of my comment above regarding the palestenians,I have just read that Khaled Meshal the leader of Hamas is making an Umrah and paying a political visit to saudi arabia. Also take into consideration that Hamas has not yet congratulated Iran on the nuclear deal. Also Hamas has publicly supported Saudi Arabia in its aggression against Yemen. Salutations to Ziad the true mentat. As the allies of the Resistance surround Jisr al-Shughoor, our prayers are with them. Pepe Escobar’s Facebook timeline referred me to a great read on strategy — Putin’s against the Empire of Chaos. But it speaks of the Romans’ long resistance to Hannibal’s incursions, and I’m driven to think of the Syrian High Command and its resistance to Obama’s cannibal hordes. Does anyone know where a map of the armies in Syria might be found? Thanks. 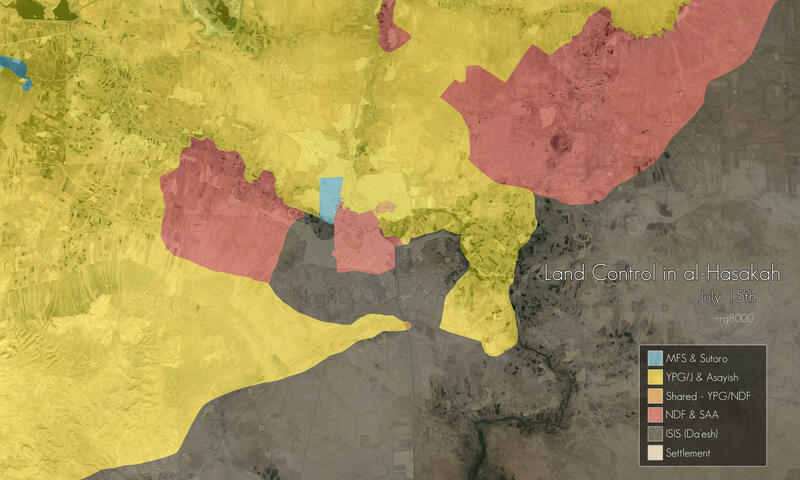 ISIS very close to getting trapped. Kurds advancing all over, supported by very, very heavy Coalition strikes. SAA will be able to hold Hasakah, well, (small) parts of it. Does that fabled dream of yours begin by the SAA losing a simple small town they captured less than 24 hours earlier? How useless …. I heard nothing of jisr al shugour being encircled on other **respectable and reputable** news sites (yes thats a jab at you, Ziad the Great Nusayri Worm) … I wonder why!!! Good news from Iraq, courtesy of IraqiNews; Foreign fighters fleeing Anbar in droves. Good article from Russia Insider, a pretty concise backgrounder on why the US is dashing about like a headless chicken. Jisr still in play? The TIger sure has been resting for a while.